If you have any group chats going, you're surely familiar with this scenario: One person sends a picture, then, within 30 seconds or so, all other participants chime in with one-word responses like "Cute," or "Awesome." It's a social nicety, so you have to expect this behavior, but that doesn't make it any less annoying when your phone randomly beeps and vibrates ten times in a row because of it. Some chat apps like Facebook Messenger and Hangouts offer the ability to temporarily mute group conversations, but this has to be done manually. You could maybe set something up with Tasker to solve this issue, but that would be more trouble than it's worth. To finally rid us of this well-known annoyance, developer iniro created an app that will automatically mute your ringer when you receive multiple messages at once. 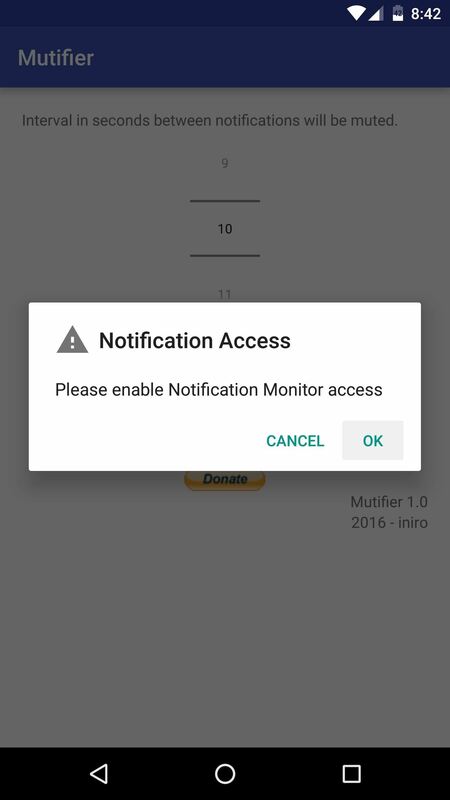 The first notification still beeps, but all others after it will be silenced, though you'll still receive the actual notification. It's a great solution to an age-old problem, so I'll show you how to set it up below. To get this one going, the first thing you'll need to do is install the app, which is called Mutifier. 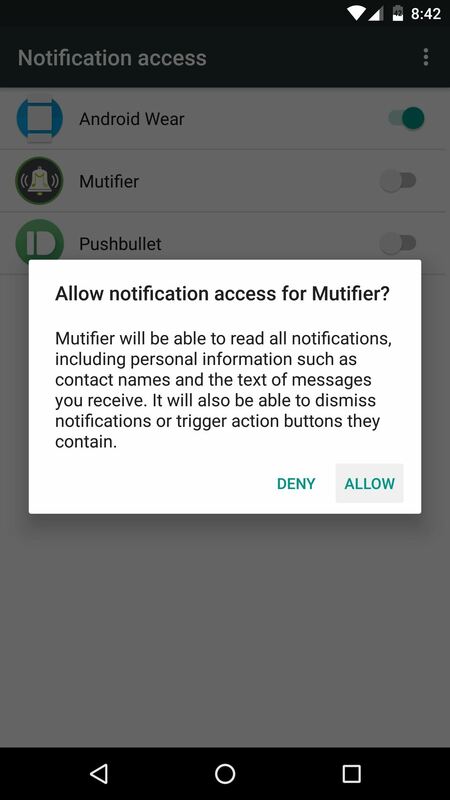 When you first launch Mutifier, the app will ask you to grant an additional permission. So press "OK" on this popup, then on the following screen, enable the switch next to the Mutifier entry, and press "Allow" when prompted. When you're done here, tap your back button once to head back to the Mutifier app. Before we get to this next part, you should be aware of how the app works. Basically, after you receive one notification, Mutifier automatically mutes your ringer for a period of time. This means that the first message from a group chat will still cause your phone to beep, but the messages that come in for a period of time after that will not. With that in mind, use the interface at the top of the app's main menu to adjust the time interval—this is how long your ringer will be muted after you receive the first notification. The default value here is 10 seconds, but I'd recommend going with something closer to 30 seconds, or even higher. Once you're done with that, make sure the "check to activate" box is ticked, then you can exit Mutifier and continue using your phone as you normally would. From now on, you'll continue to receive notifications like you always have, but with one exception. When more than one notification comes through within your preset time interval, all of the notifications after the first one will be muted. You'll still see these notifications, but your phone won't vibrate or beep until after the interval you chose expires, so your group chats should be far less annoying from now on. 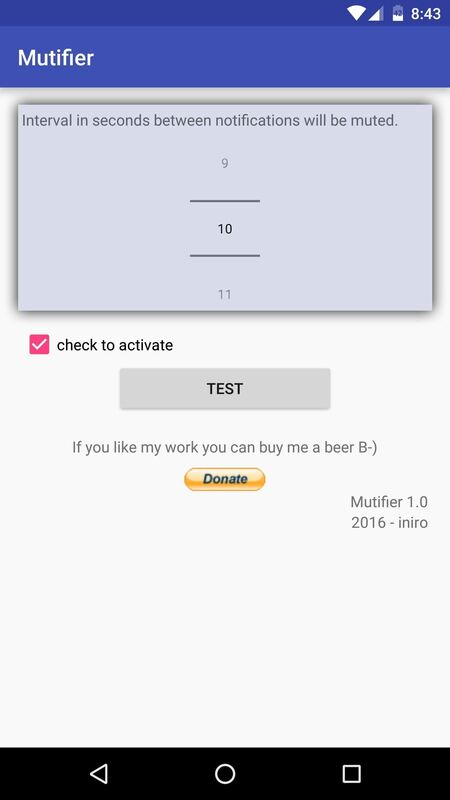 I updated to 1.2 version of Mutifier. Easy mode and custom mode have been added to the application. With the custom mode it is possible to select which applications should be muted for the selected time interval.